In Toronto the first parliament of Upper Canada exists on this site and has been the object of archaeological investigations. During the war of 1812, the United States raided the site as part of a campaign to conquer Canada. As a result Canadian and British forces attacked Washington and burned the White House. The idea of the project is a three dimensional ghost collage of the entire architectural history rendered as heritage garden. The opening of the facility will be timed to coincide with the bicentennial celebrations of the war of 1812. 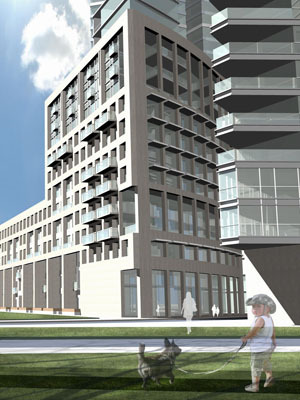 The project concerned pending development at the chaotic conjunction of Yonge Street, the Lakeshore/Gardiner Corridor, and ambitions for a public place at the waterfront. 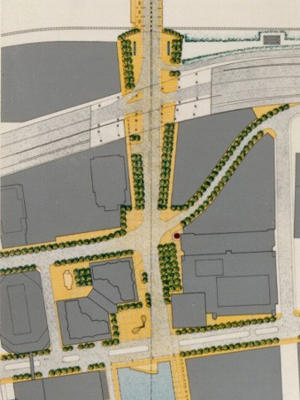 The strategy developed a figural public plaza/promenade from Yonge Street through the rail corridor across the Gardiner corridor to the water. 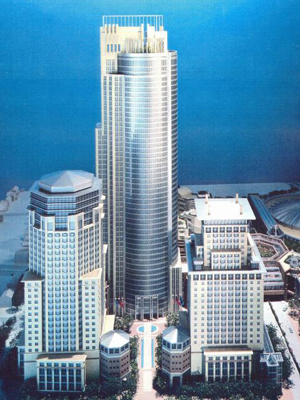 The project was largely implemented with new buildings aligned in support of the plan. The overall 2km x 2km site provides a remarkable opportunity to make a defining centralizing district. A great curved façade and arcade wrapping around the existing city hall and park precinct will create a grand unified urban design spectacle and a remarkable urban experience. A series of diverse garden squares give unique character to the district and provide the location for wonderful tea houses, pavilions, play areas, gardens, pools and ponds, outdoor restaurants and theatres as in the great Chengdu tradition. The two main open space systems: the great central park and crescent, and the system of garden squares, are in turn interconnected by a regular orthogonal pattern of streets and at the same time by a sinuous garden path. The subject property was a large tract of land at the point of entry to North York along the Yonge Street corridor. The property is adjacent to two subway lines, the busiest highway in Canada (the 401) and has privileged views of Toronto to the south. The firm led a team of architects designing a comprehensive group of buildings addressed to Yonge Street and capitalizing on views to downtown. The project is comprised of several blocks on Bay Street, between Wellesley and Grenville on the eastern street frontage. It is a ground zero site for urban intensification positioned between two subway systems on its center city site. 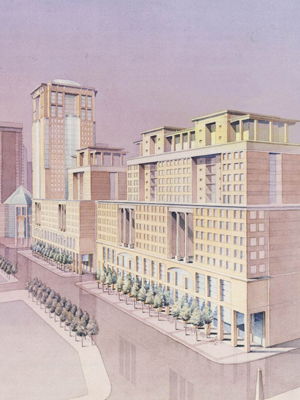 A series of mixed-use buildings positioned back from the frontage to provide a broad Bay Street promenade with canopies and porticos. A system of porte cocheres provide off street access on the laneway position and ground floors provide retail frontage on Bay. The Kirkland Partnership Architects converted the only retained on site building, an Art Deco structure on Grenville to special needs housing for the Anglican Church. Awards: Award of excellence, N.Y.U.D.A. 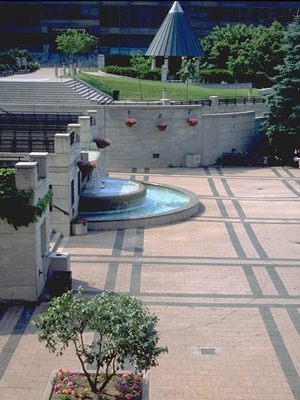 Renamed "Mel Lastman Square", the square is designed to establish an unified space for civic assembly and coordinate the disparate surrounding mixed uses. The square organizes connections between the new Central Library, Board of Education, Hotel and City Hall. It unifies adjacent neighbouring developments and creates a public place for civic assembly. Within the square, a series of special places address a variety of passive and active program requirements. These places include: a formal garden of outdoor rooms with a sculpture court; rose garden and tulip room; a wedding pavilion for civil marriages and other ceremonies; an amphitheatre and band shell for public performances; and, as its centre piece, a reflection pool/skating surface. Hamilton Harbour is historically occupied by industrial uses on its Hamilton side and exclusive residential properties on its opposing City of Burlington frontage. On the western part of the harbour a terra incognito island is situated close to the entrance to Cootes Paradise at the famous High Level Bridge. 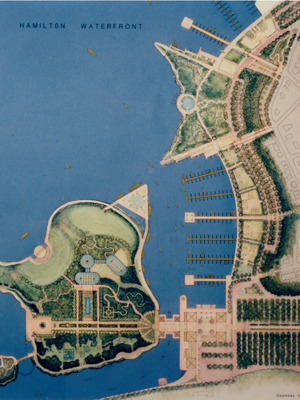 The island has been designed as a public park to begin a process of redefining the industrial image of Hamilton and act as a catalyst to other waterfront revitalization initiatives now underway. 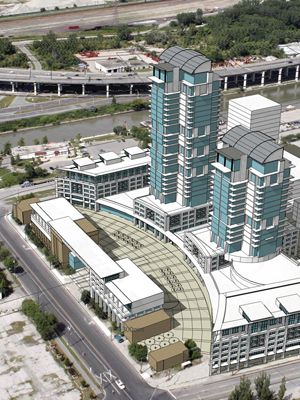 Centre Port Centre (CPC) is envisioned as vital mixed-use complex which acts as the gateway site between downtown Toronto and Toronto's Portlands. 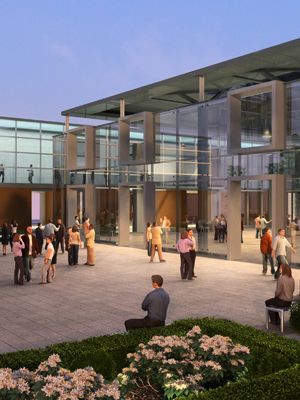 It will be comprised of public spaces, shops, restaurants, offices, and residential accommodation. CPC is organized around an outdoor plaza which is the venue for outdoor cafés, public promenades, and various events and festivals. The subject site is in a geographically significant location, a virtual sentinel in Toronto's downtown. It lies at the north east corner of Toronto Harbour in a highly visible position. The Toronto Waterfront has two major silos remnant from the city's industrial age, which bracket the harbour. The easterly of this pair stands alone in Toronto's East Bayfront. The silo is challenging since it blocks an extension to the waterfront boulevard (Queens Quay), and is impervious to transformation for conventional use, but at the same time is an admired historical artifact. 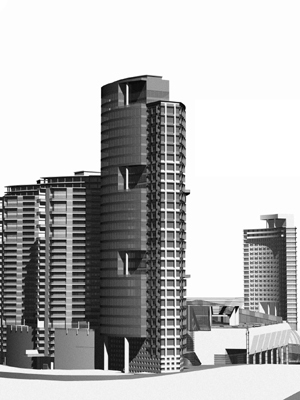 The proposal positions Queens Quay on each side of the silo so that the silo becomes part of an extended industrial heritage terrain. A sentinel tower building marks the corner of the Toronto harbour and entrance to the Don River and a flat iron building provides access to the public terrace atop the silo structure. Queens Quay is projected through the site as the waterfront, retail main street. A park on Trinity Street connects the site to the distillery district to the north and a promenade and pier link the site to the waterfront. The project is in zoning process. 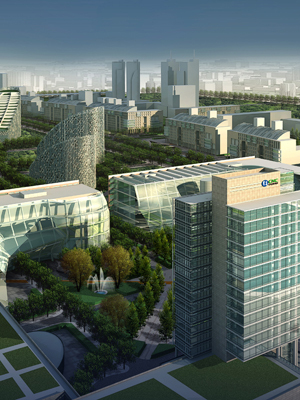 This Ambitious mixed use project was designed for a north Tehran site. Its building program includes a modern version of a shopping bazaar, an office building, three residential buildings, entertainment, and recreational spa uses, a four star hotel and an extensive underground parking facility. An extensive public roofscape is punctuated by skylights and the glass roof of the bazaar providing natural light into deep interior spaces within the commercial building volume which acts as a podium for the tower buildings and roof pavilions.